Concrete by Design uses professional grade epoxy systems that are more durable and better made than those you might find in a big box chain store. Epoxy flooring can be used in garage floors, airplane hangars, kitchen floors, or industrial secondary containment areas, and is the best choice if you want a long-lasting flooring system. 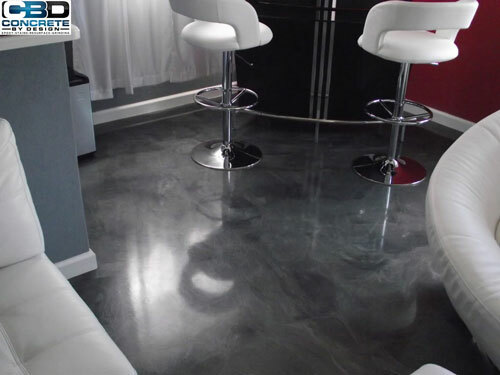 If you’re a contractor or homeowner who is looking for a decorative look, we have a selection of metallic epoxy choices from Elite Crete Systems, which will give your floor an ornate look unmatched by any other. These give the ability to imitate copper, nickel, copper, or marble finishes and are used in office, retail, and restaurant locations looking for a New Age design. Epoxy may not be the cheapest option, however. Epoxy flooring can be installed over just about any clean, prepared surface. Epoxy flooring makes the surface more repellent to water, oil, grease, acids, solvents and chemicals and can be installed on a home’s exterior or interior surfaces. The key component is a moisture barrier that lessens the overall moisture, and eliminates peeling, flaking, or delamination. We have metallic epoxy in Brass, Bubblegum, Cairo, Canary, Charcoal, Coffee, Concord Grape, Copper, Dark Green, Elite Crete Systems Blue, Green Apple, Gun Metal, Lilac, Orange Gold, Red Yellow, Rialto, Russet, Sherbet, Sky Blue and Titanium; solid color epoxy in Pewter Gray, Charcoal Gray, Saber Gray, C-Gray, Tile Red, Sand Beige, Sandalwood, Regatta Blue, Wedgewood, Emerald Green, Bright Red and Safety Yellow and chip epoxy in Blue, Brown, Dolphin, Grey, Light Grey, Medium Tan, Saddle Tan, Santana, and Tan. With so many options to choose from, you can’t go wrong! You can also go to this page for more color information. 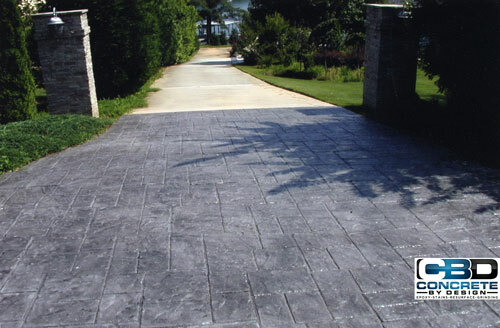 At CBD, we have the ability to give a fresh look to your concrete surface, with no hassle or inconvenience. We use polymer modified concrete products to give the overlay high strength and a durability like that of traditional concrete, but with added textures, color options and designs. In the Atlanta Metro area, there is so much ongoing development, many contractors offer concrete overlay options as opposed to carpet and hardwood floors. Many of our products can be seen in car dealerships and retail chain stores in the Atlanta Metro area, providing non-slip surfaces, which prevents slip and fall claims and also protects customers. Pool decks can also be covered with overlays. This provides cooling effects and provide a decent grip for the slippery surface around pools.